When I was very young–probably seven–the 1963 version of Lord of the Flies was being played on television one night. It was Christmastime and I was next to my mom and dad on the couch when my dad, flipping through the channels, stumbled across it and stopped. For the next three hours I sat still as stone, horrified, terrified by what I was watching, but too shy to tell my parents. 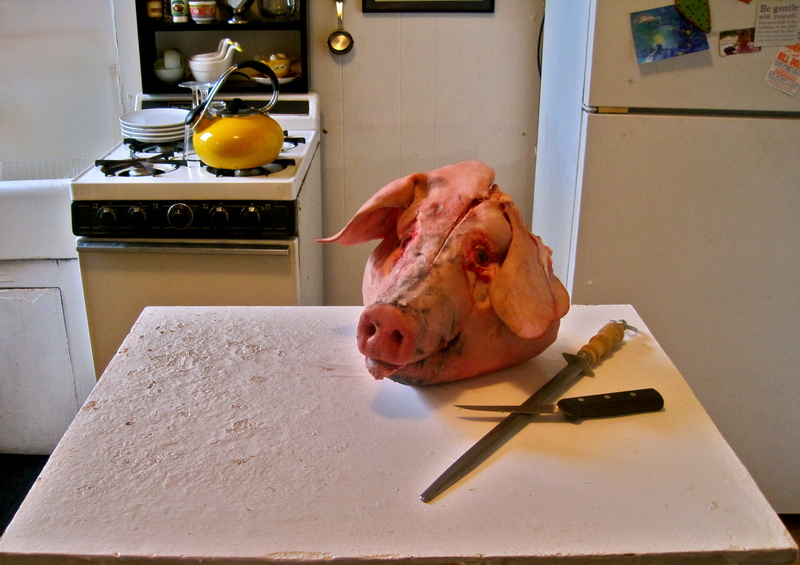 Laying in bed that night trying to sleep, the image of the fly-covered pig’s head, a stake stuck right into its neck, kept going through my tiny stressed-out brain. It’s not as though I had never seen a pig’s head before. 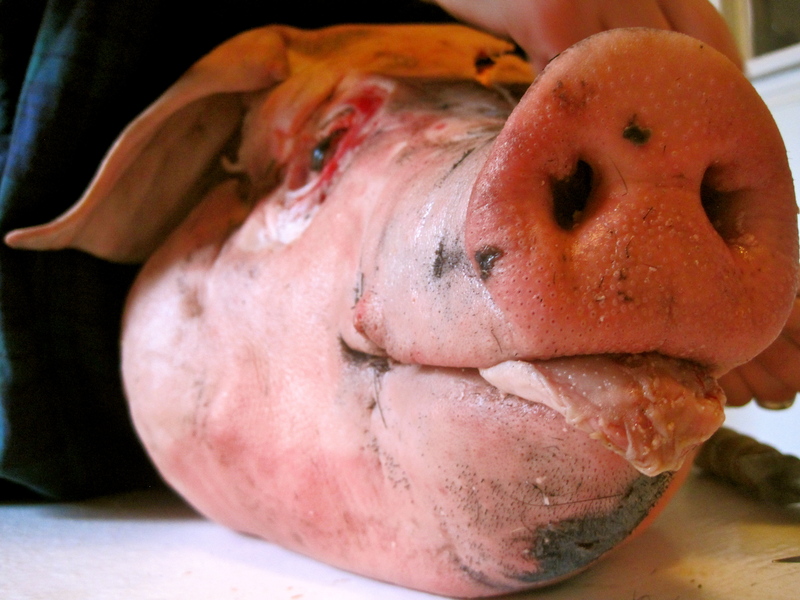 My grandfather (and his father before him) owned and ran a butcher shop in Boston, and I grew up surrounded and un-phased by meat and offal and blood, but there was something about this pig’s head that really disturbed me. That night, and for a few nights following it, I slept on the floor of my parents’ bedroom. When the boys first land on the island their civilized English manners and habits are still deeply ingrained within them. Faced with the prospect of having to kill a pig because the boys are all hungry Jack is unable to follow through “because of the enormity of the knife descending and cutting into living flesh; because of the unbearable blood” (30). Only two chapters later, however, Jack slits a pig’s throat and comes back to the camp proud with “knowledge that they had outwitted a living thing, imposed their will upon it, taken away its life like a long satisfying drink” (70). When the “littluns” start to worry that there is a beast lurking around the island panic spreads throughout the camp and Jack decides to take the head from the pig they killed and present it as an offering to appease the beast. The pig’s head, which they call “the Lord of the Flies” comes to represent chaos and disorder, savagery and the instinctual brutality of human nature (Beelzebub, literally translated is “the lord of the flies”). 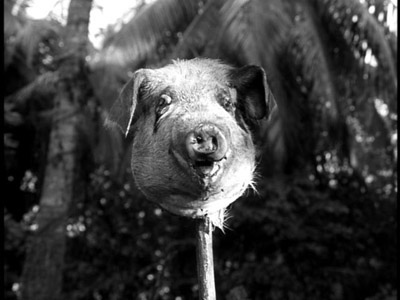 The image is so powerful, both in film and in writing, that even now, having de-faced countless pig’s heads in various restaurants, I still think about The Lord of the Flies every single time I do it. 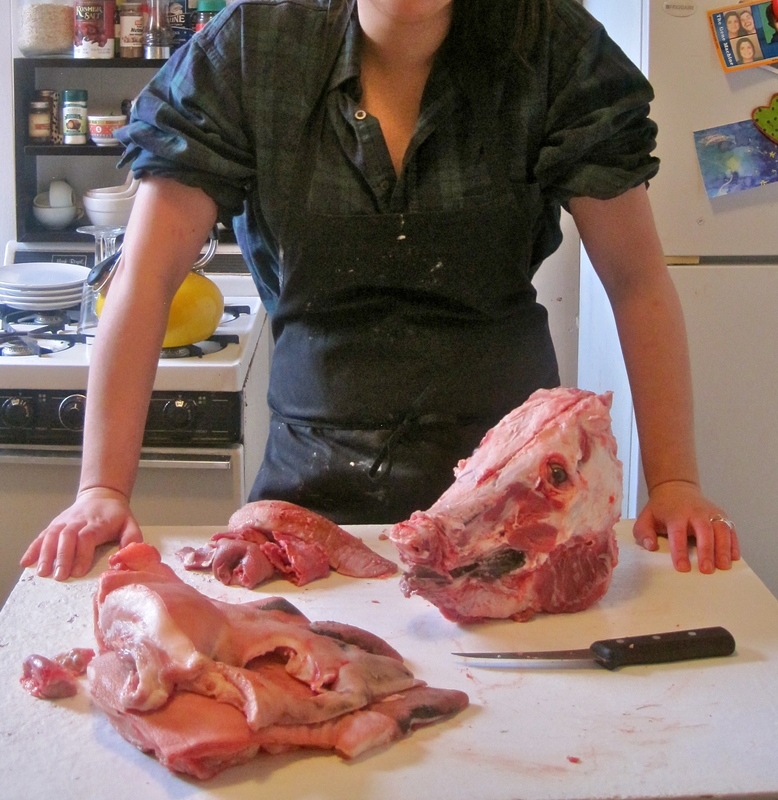 The truth is, pigs’ heads are absolutely delicious if you are willing to take the time to prepare them the right way. It seems intimidating but it’s much easier than you would expect. Most local butcher shops will have pig heads and if they don’t have one on hand I’m sure they will be happy to special order you one. 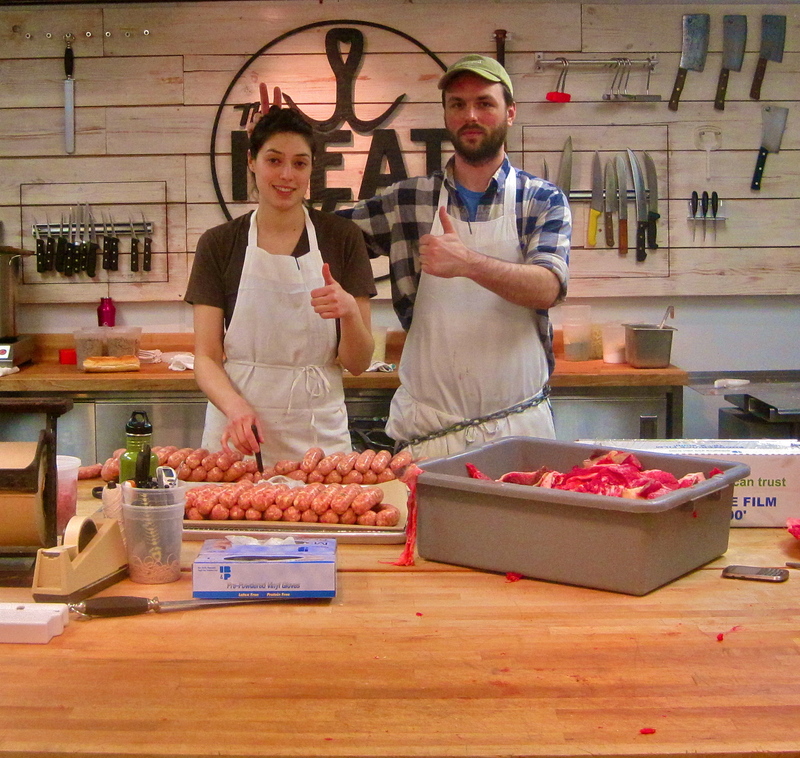 I’m lucky enough to work at The Meat Hook, where pig’s heads are plentiful. If you live in Brooklyn or near Brooklyn or you’re visiting Brooklyn come here! There are no better butcher shops or butchers out there (Don’t worry, Papa, this wouldn’t be the case if Salett’s was still open). 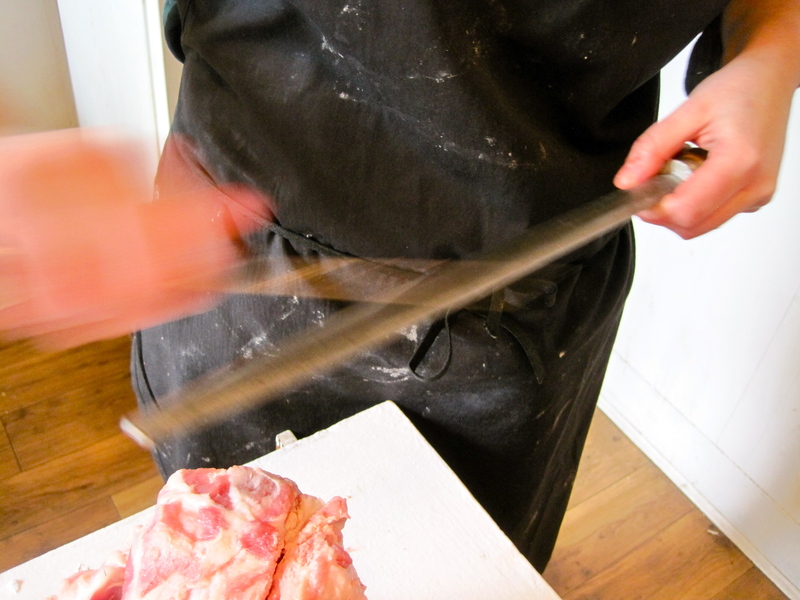 First, make sure you have a very very sharp knife and a steel to sharpen it throughout the de-facing process. 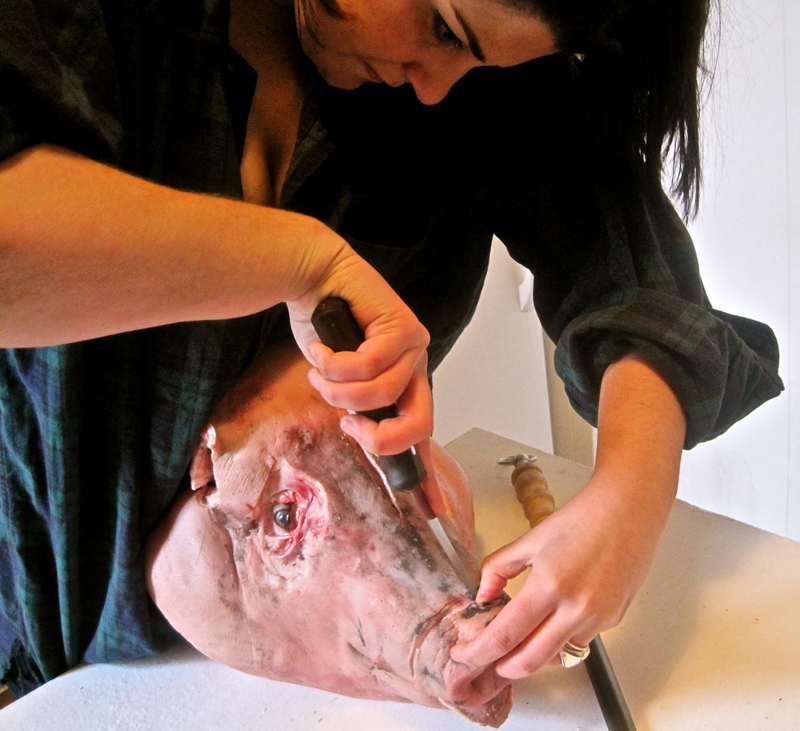 Rinse any noticeably dirty spots of off your pig’s head under the faucet, then get a disposable razor (or a couple depending on how hairy your pig’s head still is) and shave off any excessive hair–some heads come with barely any hair, some come with more. 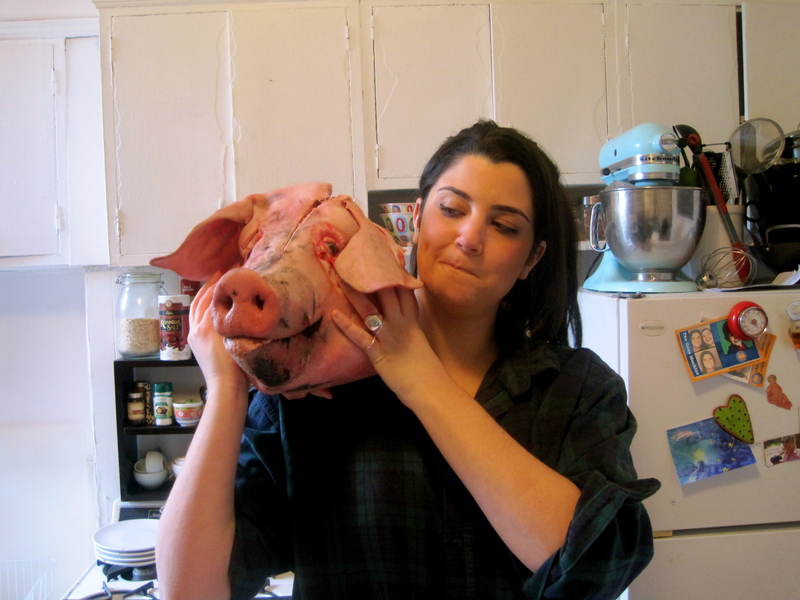 First, cut off the pig’s ears and set them aside. 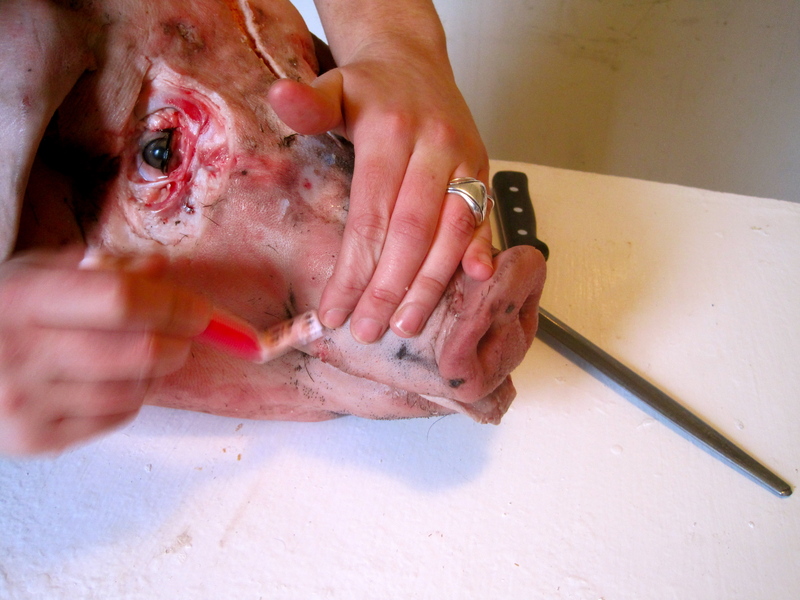 Next remove the snout by cutting around the base of the nose and sliding your knife along the bone underneath. 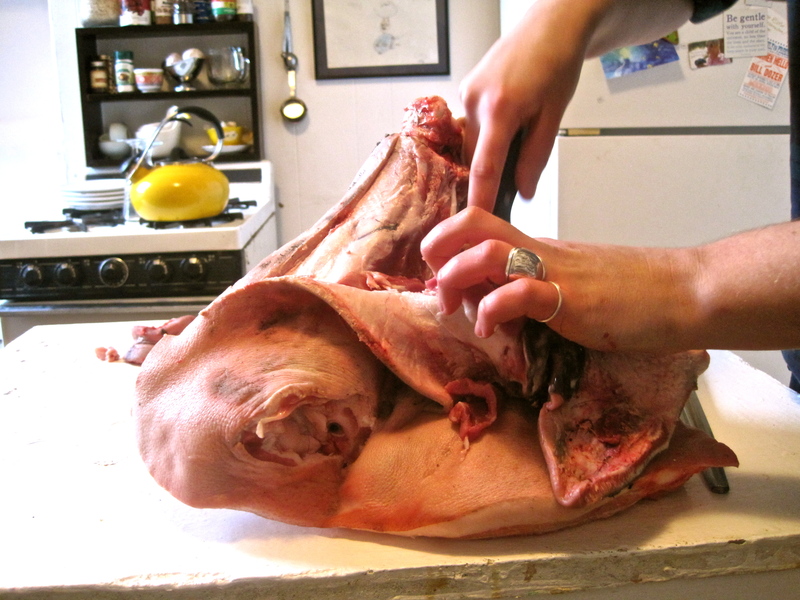 Now, take a look at your pig’s head from the back, where the head would have connected to the neck. You will see lots of dark knotty glands. Remove and discard all the glands you see. 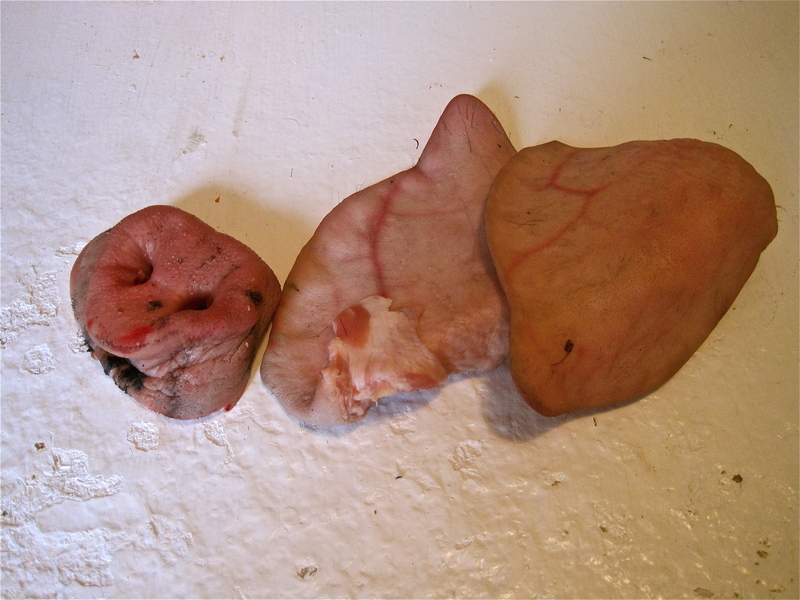 If you see some glands that look light pinkish in color and are soft and smooth save these–these are the sweetbreads. This head didn’t have any sweetbreads on it otherwise I would have taken some pictures for you. Once the obvious glands and sweetbreads are removed fold the jowls out and use your finger to feel where the jaw and cheek bones start. 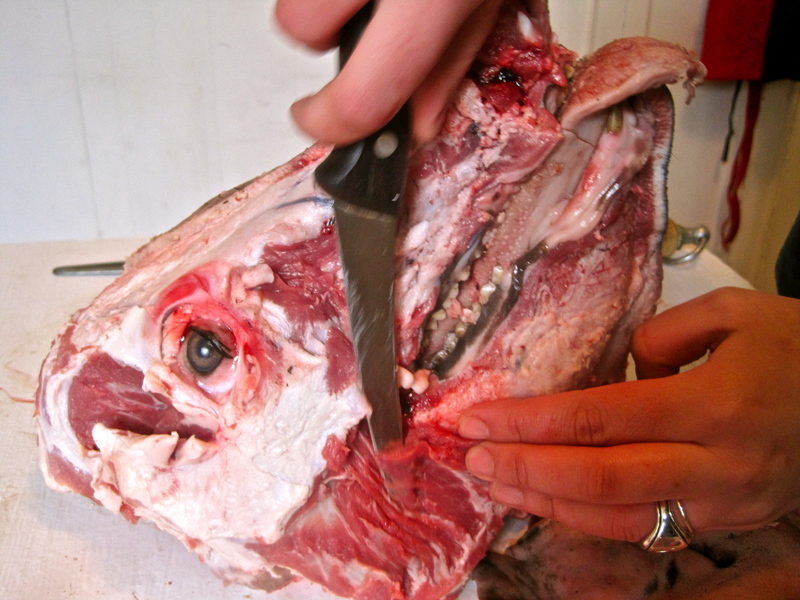 Once you locate the cheek bone set your knife against it and run your knife along it, keeping it flush against the bone to remove as much meat as possible. 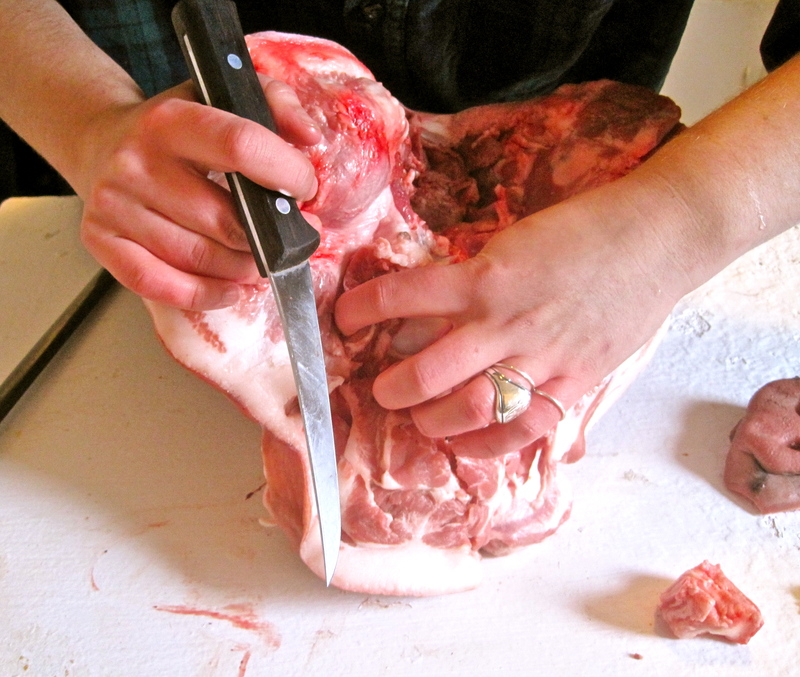 Keep pulling with your free hand to create tension so that the jowl pulls away from the bone more easily. Continue with this process, following the bone until half of the face is pulled away. Slice the one half off and set it aside, then repeat this process with the opposite side of the face. Reach your hand inside of the mouth and push the tongue backwards, you will see it start coming out of the back of the neck. Cut it loose and set it aside. Now take your two pieces of face meat and start cleaning it up. Clean off any gristly bits and glands. There will be a layer of lightly colored glands along the jowl, you can tell these are glands because they are bubbly while the meat is smooth and streaky. 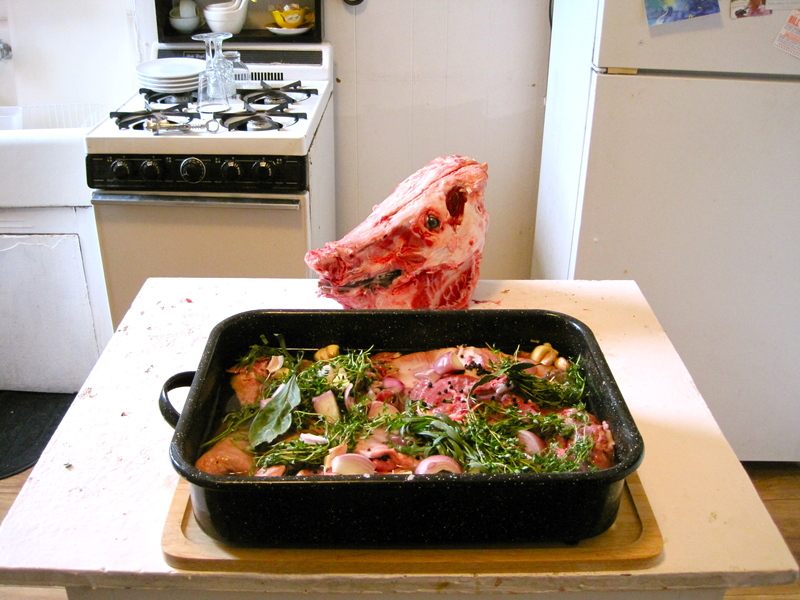 Place all of your cleaned meat, tongue and ears into a deep roasting pan. Go back over the skull with your knife to clean off any bits of meat you might have missed. Set your oven to 275 degrees fahrenheit. Pour the white wine over your meat and cover the rest of it with water. Quarter your head of garlic and all of your shallots and toss them in with the peppercorns, bay leaves, thyme and tarragon. Cover pan in foil and put in the oven at 275 for three and a half to four hours. to the left is meat, to the right, where my fingers are pointing, is the layer of glands. Once the meat is cooked remove it from the oven and strain off the liquid into a medium saucepan. Allow the meat to sit until it is cool enough to touch. Over medium heat reduce the liquid to a little less than half and set aside. 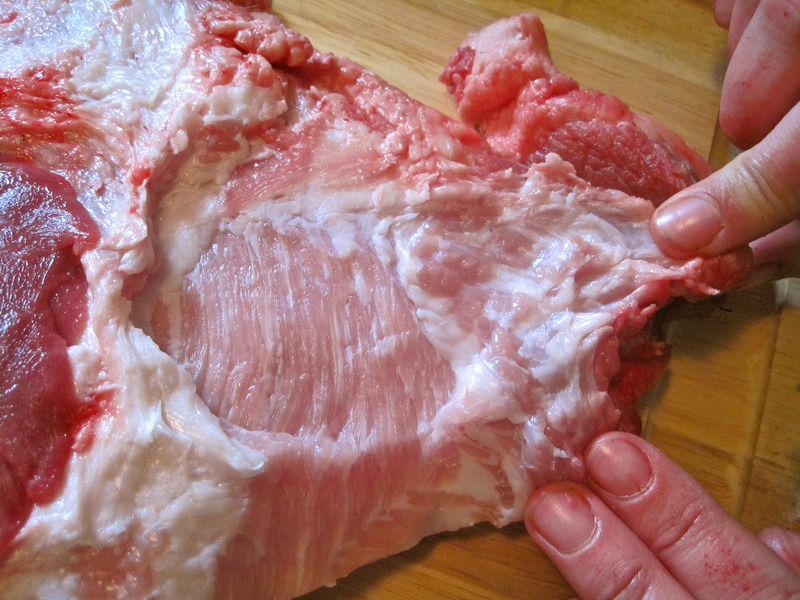 Using your fingers to distinguish between the meat and the fat and skin, pick out all of the meat and place it in a bowl. 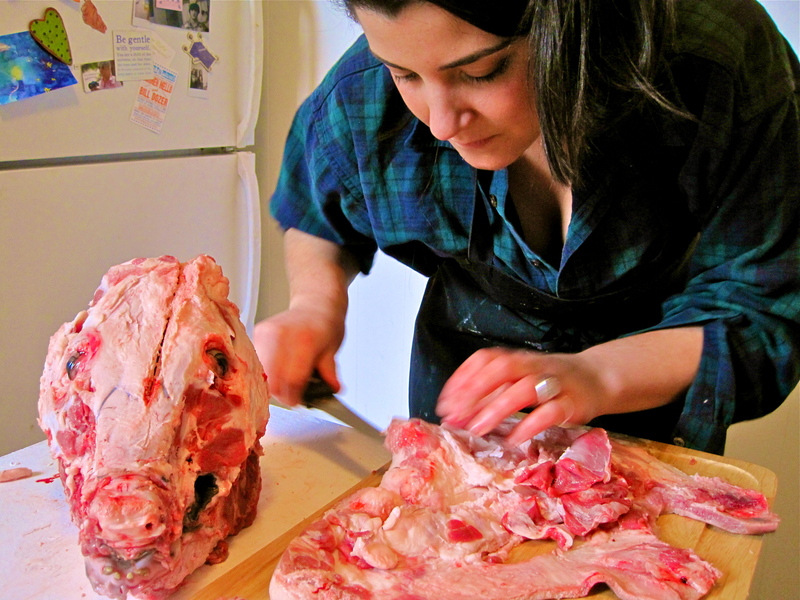 Cut the ears, snout and tongue into thin strips (peel the membrane off of the tongue first) and toss in with the meat. 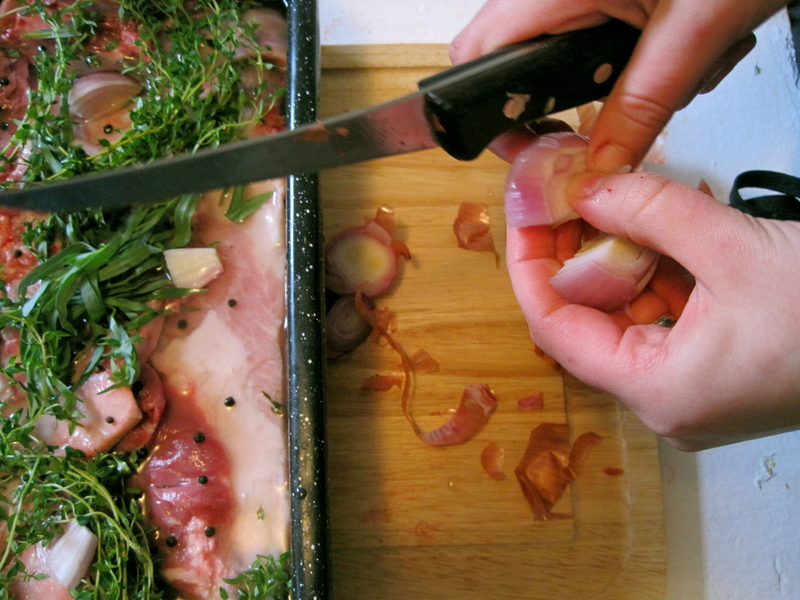 Chop up your chervil, chives and parsley and mix them in with your meat. Add dijon and vinegar and mix until incorporated. Line any vessel of your choosing with a double layer of plastic wrap and lay the meat out evenly on the bottom. 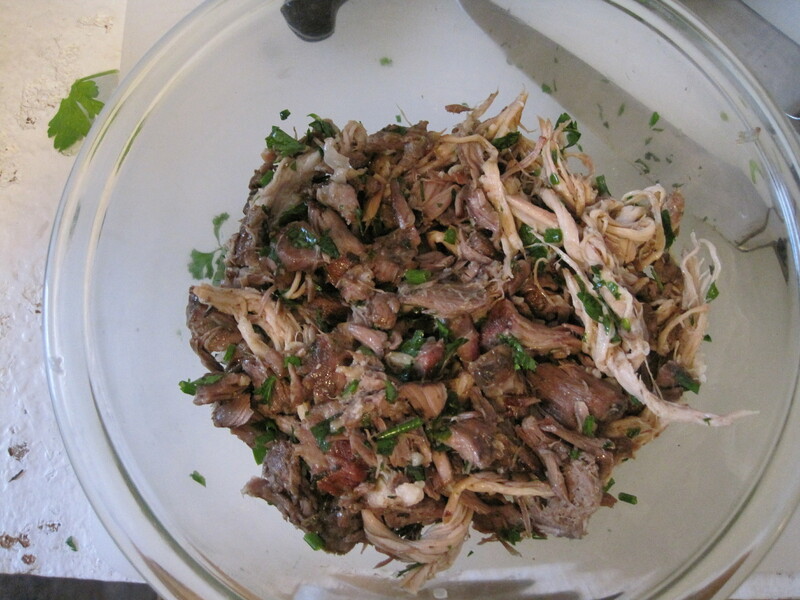 Pour the reduced liquid on top of the meat, cover in plastic and allow to set in the fridge for at least six hours. 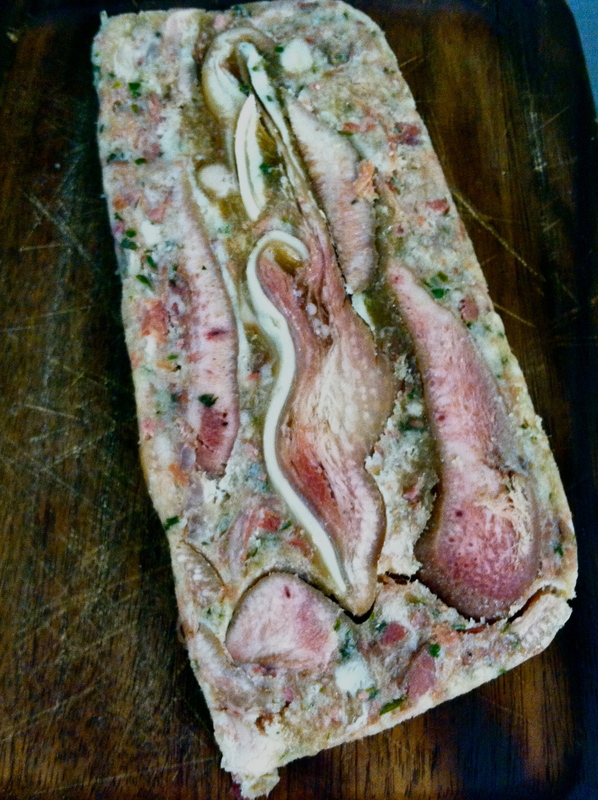 I chose to pack the meat into a loaf pan so that I could slice and serve it as a head cheese, but some people like to spread it out in a thin layer so they can cut circles out of it, egg wash it, bread it and fry it. 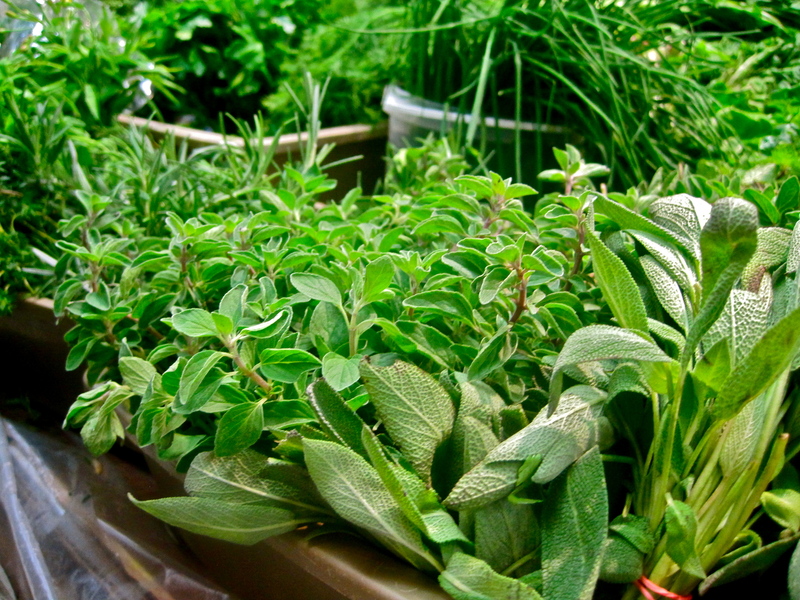 You can serve it over dressed greens, or with grainy mustard, or pickled onions, or slice it paper thin and put it on a sandwich with all of those things. Head over here and enter your email address to create a login–I promise no spam will come your way and Apartment Therapy is a great site, you won’t regret having an account. Once you have an account go here and right beneath the six blog names it will say “sign in.” After you’ve signed in there will be “vote” bubbles next to the names. Thank you everyone for all of your amazing support, it means the world to me. Now go cook some pig’s head!